To prepare the crostini: Pre-heat the oven to 190ºC/375ºF or Gas Mark 5. Cut the ciabatta or French stick into thin slices about 5mm (1/4 in) thick. Place on a baking sheet and drizzle or brush with the ol-ive oil. Bake for 10 minutes until lightly golden. (These can be made in advance and stored in an airtight container). Pesto and Prawn Topping: Halve the tomato discard the seeds and dice into very small pieces mix into the pesto sauce. 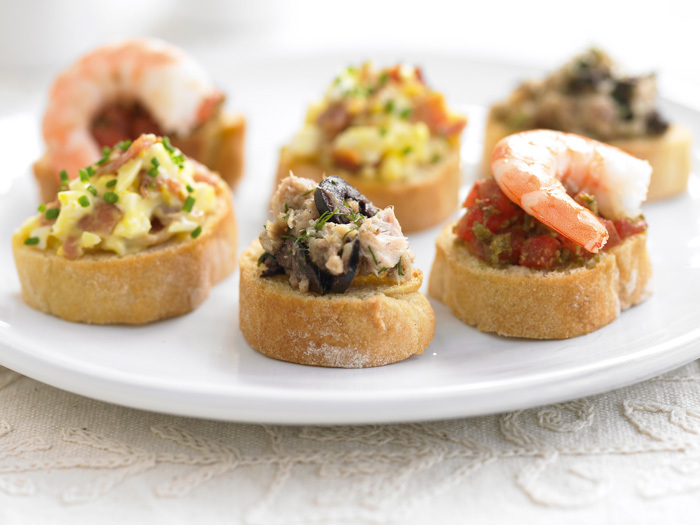 Spread on six of the toasts and place a tiger prawn on each. Brush lightly with olive oil and garnish with basil leaves. Tuna with Herbs and Olive Topping: Drain the tuna and mash with a fork, add the herbs and olive oil and mix together. Season well then fold in the olives. Spoon onto 6 of the toasts and add a small sprig of herb if desired. Egg and Bacon Topping: Grill the bacon until crisp, drain on kitchen paper then chop finely. Chop the hard boiled egg and mix in a bowl with thhe mayonnaise and bacon, season with salt and pepper. Carefully spoon the mixture onto about six toasts and sprinkle with finely chopped chives.